a touchstone: a test or criterion for determining the quality or genuineness of a thing. on wednesday night at our house of refuge, my lovely and wise friend daisha facilitated a beautiful and simple evening centered on the idea of faith touchstones. not everyone has experienced a significant faith shift (although it sure seems a lot of us have!) but the reality is that all of us experience times where we need something real, deep, and sustaining to come back to. we need a powerful truth that resonates somewhere beyond words. we need a touchstone that brings us back home. [quote]”God can get tiny, if we’re not careful. 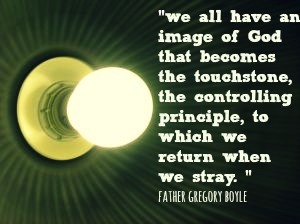 I’m certain we all have an image of God that becomes the touchstone, the controlling principle, to which we return when we stray. after she read this she gave us a card and a a few minutes and we wrote down a thought, phrase, picture, word, whatever came to mind as our faith touchstone, the thing we can come back to that is real and true for us and can sustain us when we’ve lost all the other peripherals. we didn’t discuss them or process them but rather one by one, all 20 of us, just went around the room shared ours out loud. when everyone was done, we closed. there was something holy and sweet about listening to the beautiful sustaining truths for each person there. each person’s touchstone was different, and what i loved about it is it reminded me of the unique ways God moves in each of our souls. what’s sustaining for one is different for another. the purpose of formation friday is to provide some opportunities to engage with God & our souls in some kind of intentional way. even though we touched on this before during the rebuilding after deconstructing series last year for discover what remains and “the one thing” that sustains us, i thought this was a good formation friday to consider this week. mine is the same as it’s been for a while. emmanuel, God with us. always, always, always with us no matter what. the picture i drew was of being surrounded by God, before me, behind me, above me, below me, beside me, with me. emmanuel has carried me a long way now and it’s amazing to me how sustaining it can be. I shared about that last time around. It is about the acron. I can expand on that. In the meditation group I go to, a talk was given using the acorn as a metaphor for an aspect of Christian life. As in an acorn is nourished, it grows and it turns into an oak. When I shared what I have done here with a pastor, he talked of the “righteous oaks” that I Isaiha speaks of. A common theme coming up in your postings and I know what you have expereinced as I have Kathy, is about charismatic leaders and what they get away with. I recall you sharing of the leadership team in the mega church feeling superior, you remebering what that felt like and things being done that weren’t OK that was for “the kingdom” that resulted with people being wounded and worn out with church eletism. Well, its a facet of human nature that such or simlar happens wherever there are people in positions of power. Which then wouuld men for us or at the very least we are tempted by such if when we hold such positions. I never have been in a leadership postion in a church but I do remeber the feeling of power when owning and riding what was then the fastest production motorcycle in the world. I do confess to speeding, and in a moment of clarity, I cam to the conclusion that I would lose my license, hurt myself, or worse of all hurt someone else if I continued. So I slowed down and now I get to enjoy the scenery when I ride. Last week, I was faced with an issue regarding leadership where I made a complaint. Of course the complaint was not upheld. However, I did get to have my say, and there have been some changes with regard to the issues i have raised. And guess what, people are treating me nicely and making sure things are OK with me with what is happening in this particular issue. What I have learnt is that whatever human power there is that seems overwhelming, there is aways real power it is possible to connect with in Christ, with the God given Spirit of power, love and sound mind. Before in my weakness in church situations, I would have either got angry and there be complaints about my conduct. (Perhps not too different you have talked of with pressure to be the “good Christian woman” and have thought oh for goodness sake shut up Kathy to be accepted). Or I would have overcompromised and been the “nice guy”, which then would have led to a build up of resnetment and me eventually leaving a church, often while people are saying “we don’t want to lose you” or “we love you and we value you” but not meeting my needs. Interesting question, had to think about how to express my answer. You know when you get bad news, how your knees just buckle and you want to drop to the ground? I have this feeling of God just catching me and holding me up. That and Romans 8:26. When things Happen, and we have had more of those happenings to our kids than I want to think about, all I can do is just call out, oh God. No fancy theology, no musings or bargaining or anything, just God. I know that’s all I can do at the time, and it is enough. The Holy Spirit takes over and God holds me up and I get through. There is time later for the hindsight, the analytical reasoning, but when times are tough, I have that beautiful verse. Thank you for giving us the naming of a touchstone. thank, judy. that is so beautiful. i can picture it. i really love hearing these. Emmanuel: But I would add a preposition to your list: God within me. My body is the Temple of the Holy Spirit. She dwells (tents or tabernacles) within me. There is a Thin Place within me that straddles the temporal and and eternal. A holy place. A sacred place. A place bathed in infinite Love, Tranquility, and Joy. I am God’s Dream House. He created me with the full intention of moving in … I need to stop treating God as an occasional guest. This is, without a doubt, my touchstone. My happy place where I retreat whenever I stray … whenever I forget to plug in and recharge. i love hearing these and the preposition addition, too. beautifulness. God “gets” me. That’s my touchstone. He gets me, understands me, knows me. When I feel nobody else does and even that I don’t understand me at times. He knows my past, my hurts, my struggles, those areas in my soul that I can’t put to words. Then when I make a decision, do something stupid, feel anxious, or act simply on that inner voice, I know that He knows why. That brings me immense comfort. love it. thanks for taking time to share.